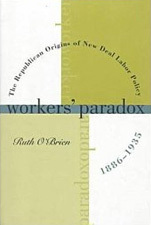 Reinterpreting the roots of twentieth-century American labor law and politics, Ruth O’Brien argues that it was not New Deal Democrats but rather Republicans of an earlier era who developed the fundamental principles underlying modern labor policy. By examining a series of judicial rulings from the first three decades of the century, she demonstrates that the emphasis on establishing the procedural rights of workers that is usually associated with the National Labor Relations Act of 1935 actually emerged over a decade earlier, in the Republican-formulated labor legislation of the 1920s. O’Brien’s findings underscore a paradox within the foundation of labor policy and the development of liberalism in the United States. The leaders of the liberal state created a strict regulatory framework for organized labor only after realizing that the mainstream labor movement’s capacity for collective power threatened to undermine individualism and classlessness in American society. In other words, O’Brien argues, the individualism that accounts for the overall weakness of the liberal state also produced America’s statist labor policy.